Cincinnati Bengals running back Joe Mixon is expected to miss two to four weeks after undergoing arthroscopic knee surgery on Saturday, according to NFL Network's Ian Rapoport. It's not clear how many games Mixon will miss, as Cincinnati has extra time to rest before its next game after playing on Thursday Night Football in Week 2. However, Rapoport noted the procedure will likely force the second-year back to be sidelined for at least one contest. ESPN's Adam Schefter reported on Friday that Mixon had a small particle in his knee that was dislodged during Thursday night's 34-23 win over the Baltimore Ravens. Mixon was taken to the locker room during the first half but later returned to help his team seal the victory. While acknowledging he wouldn't have re-entered the game had the outcome been decided, he discussed gutting it out afterward. "I had to talk myself [into] going back in," Mixon said, per the Bengals' official website. "It's mental toughness. It was real hard. ... It felt weird. The knee was hurting. The mental side of it is you always want to play 100 percent. When it's bothering you, it's hard mentally. I just had to check back in mentally and tough it out physically." Cincinnati was able to hold off Baltimore thanks in part to Mixon, who ran for 84 yards on 21 carries. Now, the Bengals (2-0) are off until Sept. 23, giving them a few extra days to game-plan without their starting tailback. Fortunately for Marvin Lewis and Co., they have a capable back they can turn to should Mixon miss any action. 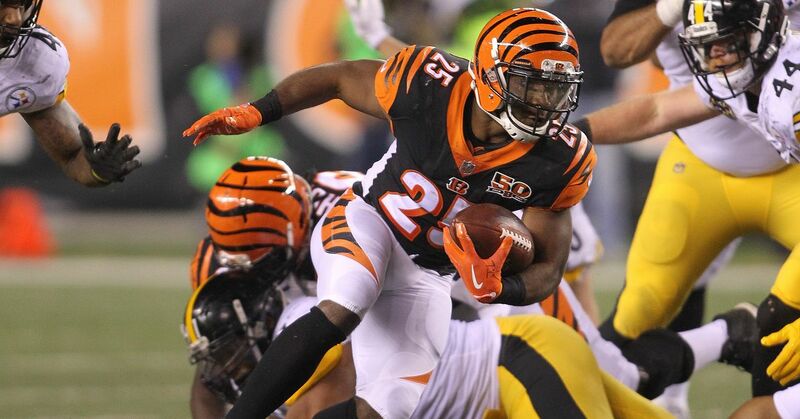 Giovani Bernard has proved to be a dynamic playmaker, both in rushing the football and catching passes out of the backfield. He averaged more than 1,100 yards from scrimmage during his first three years in the league. Injuries and Mixon's arrival have curtailed his production in recent years, but Bernard is talented enough to be the feature back while his teammate recovers. Cincinnati's biggest concern will be when Bernard is out of the game. Neither second-year back Tra Carson nor rookie Mark Walton have a carry during their respective NFL careers.